More Milliman Magic From North Carolina « They Said What? Um. Ages <1 are also "children," last I checked. 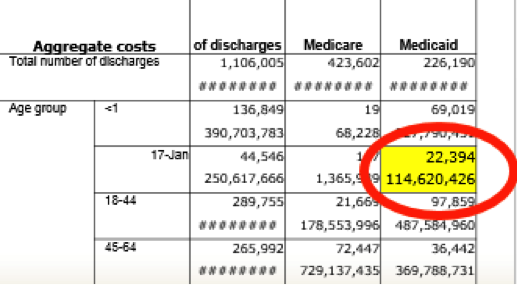 (Granted, the government's report where "1-17" prints as "17-Jan" suggests someone needs to brush up on their Excel 101.) I can't read the admission costs attributed to infants, though, because of the Helpful Red Oval. It also appears that North Carolina counts 18, 19, and 20 year olds in their definition of children, which would be another (smallish) add-in from the H-CUP database "18-44" group. You read this very carefully. Thank you for that. A few observations. The two groups don’t overlap exactly. That is true. However, the major source of admits in 18-20 year olds in Medicaid are birth events. And I don’t think a PCMH in NC is going to want to take credit for any reduction there. And you are right that the 0-1 is in one group but not the other. However, the other has disableds. As to your point about observation days, that was mostly a Medicare thing, but in any case, I also did the analysis of TN and SC concurrently. 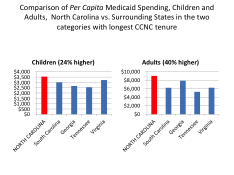 They almost exactly mirrored NC even without a PCMH. Whatever the impact was of observation days, it would have affected all those states equally. We also did ambulatory-care-sensitive admits as a group. Same result. If you can come to Philadelphia on Monday, I will be presenting the whole ball of wax. In any case, all your observations are well into the “20” of the 80-20 rule. The number of reduced admissions would have to be massive to make Milliman’s numbers add up, not slight differences due to possible non-comparable samples. Most importantly, the Milliman consultant did admit lying, in the sense that his story changed 180 degrees after we outed him. That is the toughest data point to explain away. By the way, my book Why Nobody Believes the Numbers has a whole chapter on NC Medicaid. You obviously have a great interest in this topic and the ability to read closely and thoughtfully (though it is largely a humor book since the perps are so hilariously wrong).